Delhi: Palace on Wheels - Relish the lifestyles of the kings of yore on board the Palace on Wheels, while listening to the silent tales of glory and valor told by the majestic forts and splendid palaces of Rajasthan. The dream Journey Starts From Delhi Cantt. 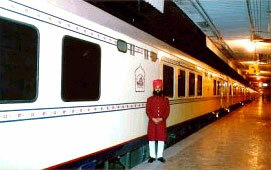 Railway Station where a royal reception awaits to welcome you on board. Jaipur: Palace on Wheels has its first stopover at Jaipur in Rajasthan - the land of Maharajas, magnificent Palaces and impressive forts. Jaipur, the capital of Rajasthan, was founded by Maharaja Jai Singh II in the late 17th century. The city is also known as "The Pink City" because it was painted pink by Maharaja Man Singh II when the Prince of Wales visited Jaipur in 1876, as pink is considered to be the color of hospitality and ceremony by the Rajputs. Jaipur still retains its erstwhile charm and is an amicable blend between traditional lifestyles and modern ways. Camels and elephants are still used as modes of transportation. Jaisalmer: Palace on Wheels has its next stopover in the heart of the Thar Desert-Jaisalmer. Jodhpur: Palace on Wheels now takes you to Jodhpur - a city ringed by a high stone wall with seven gates and several bastions. This second largest city of Rajasthan, founded by Rao Jodha in 1459, is known for its rock-solid Mehrangarh Fort. Chittaurgarh: A visit to the city of Chittaurgarh is as exhilarating as a wildlife safari. Stories of chivalry, bravery and self-respect still resonate in this land where people have preferred death over loss of dignity. Udaipur: Palace on Wheels today gives you an opportunity to visit the Venice of East - Udaipur. The "City of Lakes", Udaipur, was founded in the mid-16th century by Maharana Udai Singh on the advice of a hermit. The city is very romantic and remarkably beautiful, with tranquil lakes, lush green parks, verdant hills and historical ruins. It has a rich heritage of marble palaces and lakeside temples. Udaipur is built around the picturesque Lake Pichola. On the shores of the lake is situated the grand City Palace, with magnificently decorated courtyards, pavilions, terraces and corridors. Bharatpur: Palace on Wheels today takes you to Bharatpur Bird Sanctuary and then to the much sought city of Taj - Agra. The famous bird sanctuary, Keoladeo Ghana National Park at Bharatpur, has more than four hundred varieties of exotic birds. Many migratory birds fly in from as far as Siberia and China in winter. Visitors can quite easily spot flocks of Spoonbills and Siberian Cranes. Agra: Explore Fathepur Sikri at the entrance of Agra. It was once the capital of the Mughal Empire and the ruins are testimony to the days of glory and affluence. In Agra, visit the 16th century Agra Fort and Jama Masjid, the famous mosque.